Please be aware this is a Clearance item. This is a clearance item, which is no longer covered by a manufacturer warranty. It comes with a DOA (Dead on Arrival) Warranty Only. After this 14 day period - no returns are accepted. Please be aware compatibility issues are not accepted as a fault - if the unit is not compatible with your IP cameras - this is not classed as a fault and not covered under the DOA warranty. 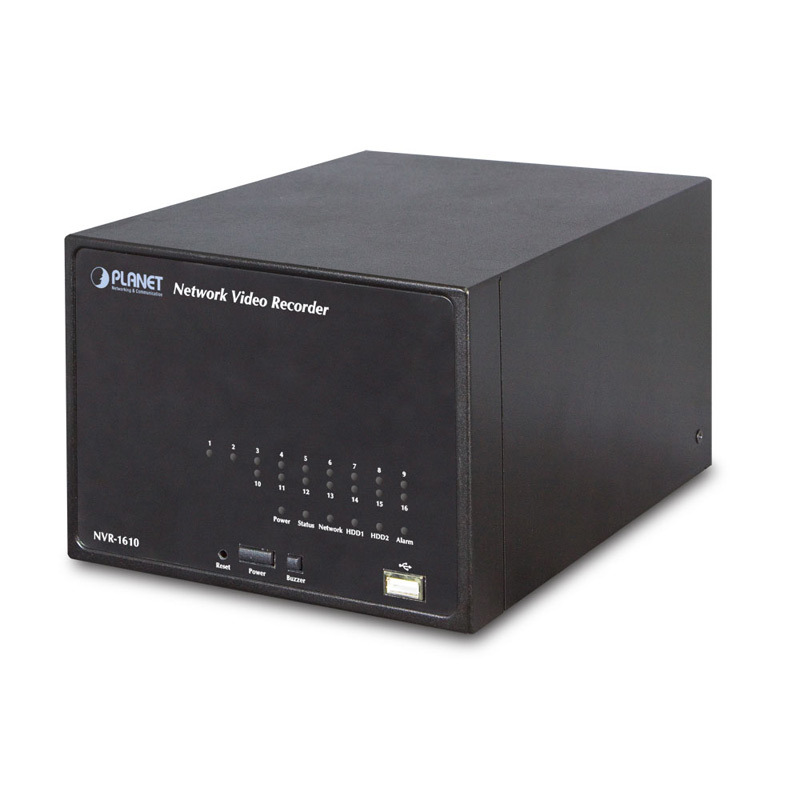 The NVR-1610 is a new Network Video Recorder series designed for surveillance systems to record and playback video from network cameras. The recorded video files can be saved in the NVR with no need of using any additional PC's for files storage, which brings users a secure surveillance system with lower total cost. Up to 16 IP cameras can be connected to the NVR-1610 via a connected IP network. Users can view remote surveillance in real time and play back recorded videos via the web browser or the bundled CMS software. The NVR-1610 not only supports PLANET IP cameras but is also compatible with many of the major IP camera brands in the market. Furthermore, the NVR-1610 can automatically search and find the available cameras in the network so it greatly reduces effort when setting up the system. Not just for small scale applications such as retail stores and SMB, the NVR system is expandable for multi-sites management with the bundled CMS software. The CMS software can manage up to 16 NVR units at the same time, that means, there can be 256 channels of IP cameras being viewed simultaneously. With multi-monitor and E-Map function, the NVR can help the administrator to monitor the surveillance system more efficiently and effectively. The NVR-1610 features smart setup wizard program for users to easily setup this device. It supports web-based management interface for the administrator to remotely manage the device via web browser without any concern. It also provides the management utility for central management of the surveillance network. This state-of-the-art and powerful software / hardware in one design is considerable to fit in various network environments.